SUP fishing is becoming very popular and All Water Adventures has focused much of our efforts providing the best boards, lessons and SUP fishing instructions to our ever growing clientele. It’s a special feeling paddling out to your favorite fishing spot and catching a fish off your board. The quiet, peaceful nature of paddle boarding allows for a stealthy approach while stalking your quarry. Paddle board fishing is a relatively new sport and many anglers are welcoming it with open arms. All Water Adventures offers many ways to get in on the action. First off we offer SUP fishing trips on the best boards in the industry, BOTE Paddle boards. BOTE has taken the market by storm with their stable, stealthy and maneuverable HD series boards. As well they are the first to offer a Tackle Rac and cooler options built for fishing! 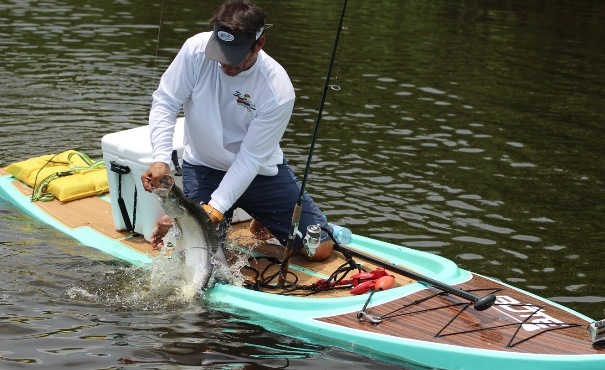 Even BOTE’s Breeze and Drift Inflatable paddle boards reek of fishing options. We offer daily fishing trips aboard these models in search of tarpon, redfish, snook, black drum, ladyfish, snapper, flounder and more. Our guides Capt. Alex and Cory spend time teaching new SUP anglers the basics and offering assistants to the expert. Earlier in July, Cory guided Bass2Billfish show host Peter Miller and friends to some exciting fishing. They caught tarpon, snook, trout and gar while fishing with live baits off BOTE boards. Look for show airing dates soon. Bring your own tackle or use ours. We offer trips the famous Banana River NMZ in search of giant trout and redfish in super skinny water. We proudly sell the full line of BOTE boards, our specialty is getting clients on boards. We know buying a paddle board is a major investment. All Water Adventures wants to get you on a board first so you are certain you like it. Call us to set up a fishing SUP demo today. 321-222-7511. We have many boards in stock for you to try…or book a paddle board fishing trip with us, if you purchase the board the trip is on us! SUP fishing tips, What to bring.